Above an illustration from an 1887 Swedish sport book showing a ‘newer’ rowing machine. 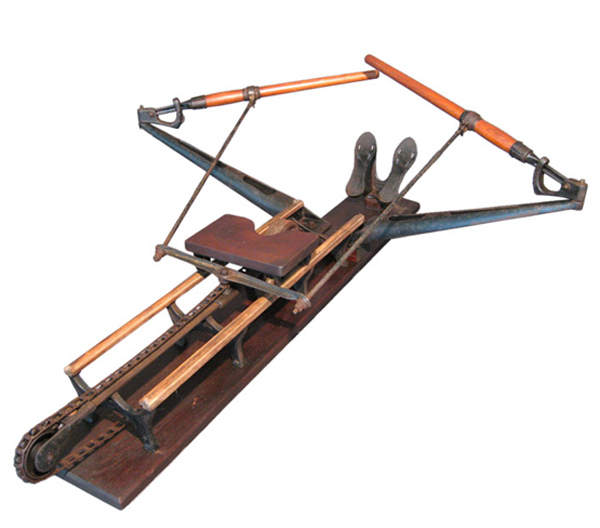 “Early rowing machines are known to have existed from the mid 1800’s, a US patent being issued to WB Curtis in 1872 for a particular hydraulic based damper design. Machines using linear pneumatic resistance existed around 1900, but they did not simulate actual rowing very accurately, or measure power output. “In the 1970s the Gjessing-Nilson ergometer from Norway, used a friction brake mechanism with industrial strapping applied over the broad rim of the flywheel […] This machine was for many years the internationally accepted standard for measurement. An early advertisement was for ‘Vigor’s Home Rower’. 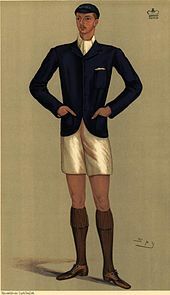 It appeared in an 1896 edition of Black and White magazine. From the picture it is not clear how it works and I do not know if it really was a cure for ‘asthma, weak lungs, nervousness and constitutional weakness’. It was, however, endorsed by The Emperor of Germany and, more interestingly for us, Lord Ampthill (on the right), a multiple University Boat Race and Henley winner. 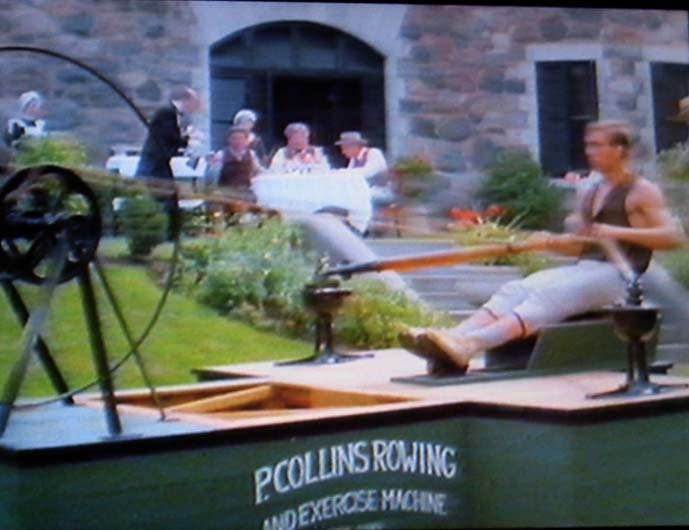 A great example of an early (and quite effective looking) rowing machine appeared in the 1986 film, The Boy in Blue (staring a very young and very ‘buff’ Nicolas Cage) loosely based on the life of Canadian world champion sculler, Ned Hanlan . The ‘Tideway Slug’ has the story of the film here and also a picture of the wonderful ‘P. Collins Rowing and Exercise Machine’. A Nicolas Cage fan site has this nice clip of it in action. 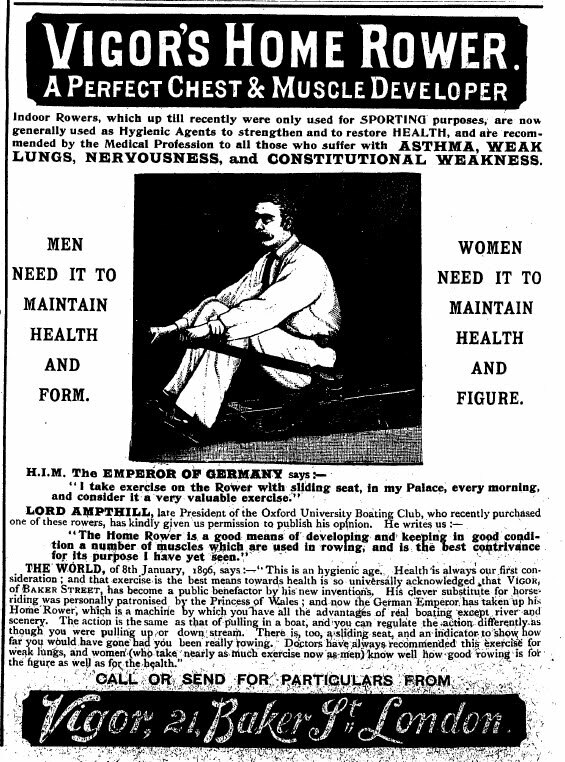 Was this machine based on a real indoor/outdoor rower or was it (as I suspect) an invention of the film makers? If anyone knows, please tell me. 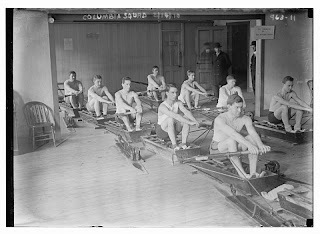 One of the most popular late nineteenth/early twentieth century rowing machines was produced by Spalding of the United States. Above is a lovely example which is for sale here. The resistance is provided by a chain around cogs. I presume that the resistance of the cogs could be increased to vary the work in the drive phase and that there would be some sort of ratchet system to allow a smooth recovery. The above 1910 picture of Columbia University oarsmen seems to use the same cog and chain system but, as it is a rowing action and not a sculling one, it is placed to the left or right of the rower. A British Path newsreel shows that these were still in use in 1924. Perhaps they were all made by Spalding? 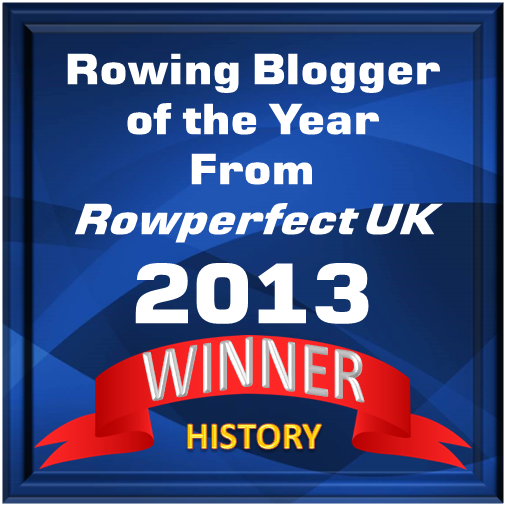 As Wikipedia says of early rowing machines, ‘they did not simulate actual rowing very accurately’. The two main problems were that the resistance was often not constant through the drive phase and that there was no simulation of the ‘run’ of the boat on the recovery. It is strange that the relatively simple system of ‘air resistance’ that we use today (notably on the Concept machine) was not commonplace from the start. The Concept 2 website shows the evolution of their machine, though the basic design remained the same until the introduction of the ‘Dynamic’ a year ago. Constant air resistance provides the closest feeling to pulling (or, more correctly, pushing) an oar through water, and is superior to any spring, hydraulic, liquid, weight or friction based resistance method. Also, the constantly spinning heavy flywheel simulates the run of the boat and the feeling of ‘picking up’ a moving shell at the catch. Modern electronics now makes the whole thing infinitely measurable. Before the dominance of the Concept 2 ergo, the closest to the feel of ‘real’ rowing that was obtainable on land was in the ‘tank’. Americans seemed to have led the way in innovative tank design as evidenced by this 1933 newsreel. A simple internet search reinforces my impression that tanks are still more popular in the United States than in Britain where they are increasingly converted to gyms and ergo rooms. A form of ‘floating tank’ used at Oxford can be seen here. The film gives the idea that the ‘Octolog’ was an innovative British idea but they existed in the US in the 1930s and, I think, continue in use today. 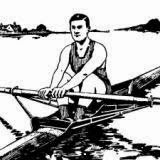 Few would hesitate to say that the modern ‘ergo’ has produced the greatest change in training and testing methods that the sport has seen since the work of Steve Fairbairn in the inter War years. Said another way (and a particularly popular view from those of us who never got below 7.30 on their 2k tests), ‘Put an ergo on the water and it sinks’.